Membership Meetings: Save the Dates! For each event, we’ll be putting together an enticing combination of convivial networking with colleagues from around the state, a productive business meeting, and engaging, practical learning opportunities for staff at all member libraries. In keeping with our longstanding tradition and belief in the power of good food, we’ll also furnish a delicious lunch for all. Stay tuned for further announcements about speakers and the opening of registration. Registration for membership meetings is free of charge. We’ve been planning some excellent, timely, and relevant continuing education events for our colleagues this fall & winter, with a mix of webinars and face-to-face workshops to suit every professional learning need. We hope to see you at one or more! LibraryLinkNJ webinars are presented free of charge to members of the New Jersey library community. We archive recordings of the webinars, along with presenters’ slides or handouts, for easy access following the live event. Youth services librarians are all about getting the right resources for their patrons, but our range is often limited when seeking resources for ourselves. Librarianship shares many commonalities with other fields in the recreation, education, and even business sectors. Join us as we identify these fields and key resources within them, learn how to apply those ideas to programs and services within the library, and explore how we can use these similarities to build relationships with potential community partners. You have a great idea and wonder how you can present it in a persua... forget this. I'm going to give you a rare opportunity to listen in while we talk, library leader to library leader. Yo, Directors, Managers, Supervisors, Leaders, and other muckety mucks: Isn't it nice that most of the people you supervise almost never give you any suggestions at all, and the few suggestions you do get are boring, impenetrable, or impossible? If you want to go on coming up with your own ideas and ignoring the few ideas your colleagues bother to present, then I recommend *not* letting them participate in the "The Right and Proper Way to Play Mind Tricks on Your Supervisor" webinar, which will not only teach them to read your thoughts, it'll teach them to BLOW YOUR MIND. And who wants that, right? This program is offered in collaboration with MentorNJ, a joint initiative funded by the New Jersey State Library and LibraryLinkNJ, The New Jersey Library Cooperative. Please save the dates for the following webinars. We’ll be opening registration for each one about a month before the event takes place, and will announce registration for each widely. An annual tradition at LibraryLinkNJ! This will be the sixth time Roz joins us to share all the titles your readers will be clamoring for in 2017. Your library collects data all year round. Come learn how to present it to stakeholders so you really shine. 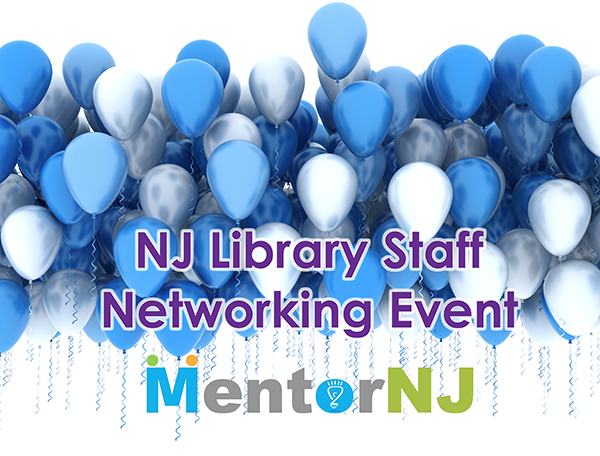 MentorNJ In-Person Networking Event, with presentations & table talks by ALA Past President Courtney Young, Fobazi Ettarh, Tiffany McClary, Sophie Brookover and more: Wednesday, November 9, 2016 - registration is open now! This event is free of charge & will include a delicious buffet lunch. New Programs Added For This Year! It’s time for our LibraryLinkNJ back-to-school discounts roundup! We hope that our school library members are enjoying a successful return to school. As you start to think of new products you’d like to purchase this year, remember that LibraryLinkNJ has many discount offers on databases in the K-12 market. Here are some recent offers, as well as reminders about some long-standing discounts (most are available to other library types, too). Please direct questions about products and pricing to the vendor contacts provided on each discount page, linked below. Save on ebook frontlist titles, whether your library already has GVRL or not. Packages for elementary, middle and high schools restore collections to original (2013) levels provided by the NJ State Library. Save on ebook and audiobook packages. JLG discounts are rare, so if you’re thinking about a purchase, don’t miss out. Enjoy special savings on this service (formerly Text-a-Librarian) which makes it easy for librarians to connect with patrons anytime, anywhere via chat, text and email on any device. Integrated tools to support authentic research and original writing, paired with online teaching units and offline expert assistance. District discounts are also available. Includes reference databases, newspaper collections, eLibrary, CultureGrams and more. ImagineEasy is no longer offering paid school subscriptions. Instead, they are offering a new version of EasyBib for educators called EasyBib EDU. It is free and was released in August. Interested schools - including those who have never been subscribers - may sign up for it on EasyBib EDU.